The Bay Skipper Program is designed to train and certify members to confidently and competently skipper an offshore capable sailboat, >30’ in length, with a keel and live-aboard accommodations. We sail and train mainly on the Chesapeake Bay out of Annapolis, Maryland, and occasionally sail around the Delmarva Peninsula. If you want to get more involved in the actual sailing, navigation, and eventual skippering of mid to large size sailboat, then some additional training above the Basic Sailing Course is required. This is where the Bay Skipper Program comes in. The PSC Bay Skipper Program is designed to be a natural progression from the Basic Sailing Course offered by the club..
We currently train and certify club members to ASA 104, ASA 105, ASA 106, ASA 114, and ASA 118 standards. 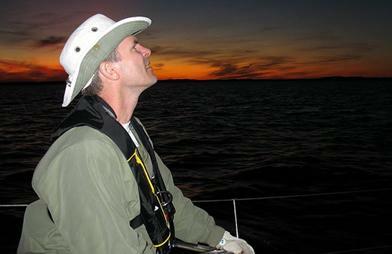 We offer these courses periodically throughout the sailing season. 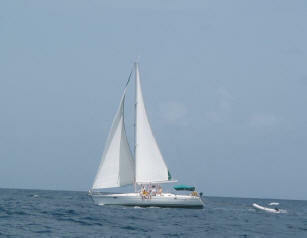 Our Bay Skipper Program will get you the skills and qualifications necessary to comfortably command larger sailboats. Organize the logistics for a Bay sail. Work up a piloting and navigation plan. Provide instructions and safety/weather briefings to the crew. Assign crew duties and get the boat underway. Provide direction, guidance and training to the crew while underway. Return the crew and boat safely to the home port safely. At the end of the day, have a crew that has had a great day on the water, and is ready to go sailing again. Self-paced, but sequential completion of an extensive “checklist” of Bay sailing skills or Bay Skipper Qualification Checklist. Documentation of sailing hours underway, under sail and at night. Successfully pass 3 written examinations - General Knowledge, Rules of the Road, and Piloting & Navigation. Two on-the-water (OTW) sailing evaluations with the final one being from a Senior Bay Instructor. If you would like to enroll in the Bay Skipper Program, all you need to do is declare yourself a Bay Skipper Candidate with the Training Commodore and start signing up for Bay sails. Any Bay sail (private sails included) supervised by a PSC qualified skipper will count towards your total time on the water required for certification. This includes our annual Memorial and Labor Day raft-ups, flotillas, and club sponsored sailing events (e.g., BVI trip). The Bay sails are advertised in the early spring for the entire season that runs from April through November. Don’t put it off signing up as the Bay sails fill up fast. For more specific details on our sail training programs, please refer to the PSC Training Policy and Procedures.